The St. Louis nonprofit Prison Performing Arts has been putting on plays with incarcerated people for 19 years. Here, Brittany Curry and Danielle Jones-Mack rehearse at the penitentiary in Vandalia, Missouri. It’s opening night for “Hip Hop Hamlet” and more than 200 women dressed in baggy, khaki-colored clothes have packed into the gymnasium at the women’s penitentiary in Vandalia, Missouri. They’re eager to watch fellow members of the prison population perform a beat-filled, rap adaptation of the Shakespeare text. Shakespeare scholars say his work offers ways to get in touch with what makes a person fully human. For the women participating in this show, that plays out at a very basic level. St. Louis Public Radio's Jeremy D. Goodwin visited a group of incarcerated women in Vandalia, Missouri as they rehearsed and then performed a hip-hop adaptation of Shakespeare's "Hamlet." When they’re rehearsing or performing with the Prison Performing Arts program, a St. Louis-based nonprofit, they’re allowed to have some forms of basic human contact that aren’t allowed out in the prison yard or in the dorms. “We get to be closer to each other,” said Autumn Smith, 32, who plays Hamlet. She’s there serving time for convictions stemming from a drunken driving accident, including involuntary manslaughter. Autumn Smith (left) and Katherine Leemon, who play Hamlet and Laertes, rehearse a scene from "Hip Hop Hamlet." “Hip Hop Hamlet” was the last play created by Prison Performing Arts’ founding artistic director, the late Agnes Wilcox, before she retired in 2016. It was written in collaboration between Chicago-based theater-makers Q Brothers and men incarcerated at the prison in Bowling Green, Missouri. The production by the women at Vandalia, about 100 miles northwest of St.Louis, is the second time anyone has performed it. Christopher Limber, who took over the nonprofit’s artistic reins after Wilcox retired, directed the show. Director Christopher Limber took over the artistic reigns of Prison Performing Arts after the late Agnes Wilcox retired. To his right is sound engineer Erica Nowden. “Hip Hop Hamlet” includes singing, choreography and stage combat — all out of bounds in most situations at the prison. Amy Sherrill (left) and Laura Hulsey play Polonius and Ophelia. Hulsey said her work with Prison Performing Arts gives her a chance to have some of the basic human contact that would be out of bounds in other contexts at the prison. Hulsey will complete her five-year sentence for first-degree assault just a few weeks after the show. She and Smith have grown close while imprisoned, and their rapport carries over onstage as Hamlet and Ophelia. Hulsey pointed to one moment in the production, when the cast needed to find a way for Hamlet to interrupt a bunch of commotion. She’d been having a particularly bad day, and suggested that Smith just let out a big scream. Limber liked the idea, they tried it, and it worked. 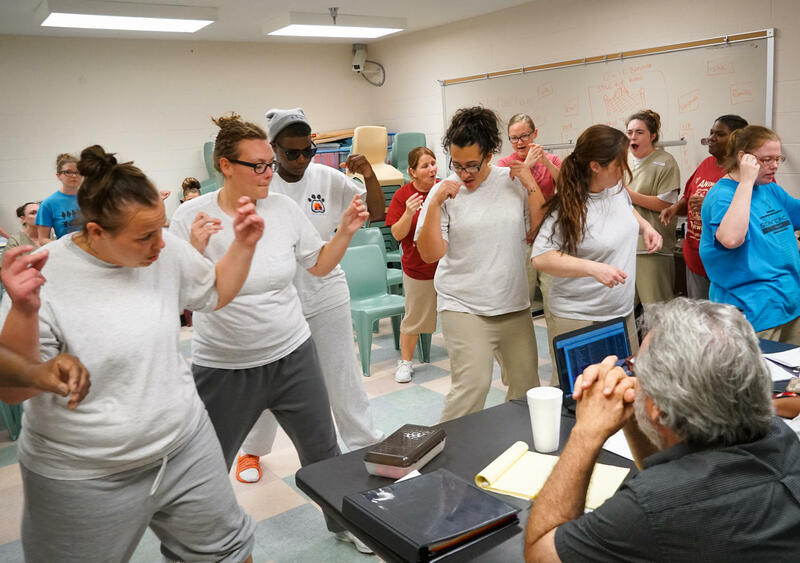 Women at the prison in Vandalia, Missouri, rehearse a scene from "Hip Hop Hamlet." "You get to be your true self"
Even the less dramatic moments provide a measure of catharsis for participants. “There’s moments when you get to be your true self here in the practice and you can’t be that on the dorm because you sort of always have to have your guard up,” said Katherine Leemon, 34, who plays a fierce Laertes onstage but peppers her conversation with laughter. She was convicted of first-degree robbery and is due to get out of prison in 2021. Evon Edmonds-Childs (left) and Autumn Smith rehearse a scene as Horatio and Hamlet. When they perform for the prison population a few days later, their audience is enthusiastic. Smith said her experience has given her a big self-esteem boost to take with her when she completes her sentence. Director Christopher Limber watches as the cast rehearses a dance number. When the women perform for the prison population, the audience watches with enthusiasm, frequently breaking in with laughter and applause. In a question-and-answer session right after, several women stand up to thank the cast and crew for inspiring them. One prisoner says she has trouble laughing at things these days, but the show put a smile on her face. Afterward, the Prison Performing Arts participants change out of their costumes and break down the cardboard set pieces as the audience exits the gym. It’s time for everyone to shift back into a more regular prison mode. One woman rushes up to Hulsey and gives her a congratulatory hug. Agnes Wilcox founded Prison Performing Arts 23 years ago. Last year, she retired as director of the organization, which involves inmates and former prisoners with theatre. A few days from now, on January 25, the Arts and Education Council will award her the lifetime achievement award in the arts for her work with the organization and other contributions to the St. Louis arts scene. St. Louis’ Prison Performing Arts serves 1,000 inmates every year, some as actors, others as audience members. But leaving prison doesn’t have to mean saying goodbye to the program. Through its Second Acts Ensemble alumni troupe, PPA provides a theatrical outlet on the outside for those who honed their acting skills behind bars. In our latest Cut & Paste podcast, we talk with Robert Morgan and Lyn O’Brien, two Second Acts members, about how PPA and recently deceased founder Agnes Wilcox changed their lives.